Tarm® manufactures show laser light systems for more than 35 years. This experience in high quality manufacturing influences every tarm® show laser system that is built in our production. Achieving high output power in combination with great beam specifications and optimized s canning is our main goal. We use high quality optical components and rely on professional electronics development. Being a Laserworld company gives us access to the top end developments from e.g. the R&D of RTI and allows tarm® for manufacturing high end quality products at affordable prices. The tarm 2.5 show laser projector is a full color whitelight RGB laser systems with full analog color modulation and diode-only equipment. The guaranteed output power is specified at 2'700 mW after optics. The tarm 2.5 (ShowNET) comes with integrated ShowNET network interface and free laser show software. Details in the box below. 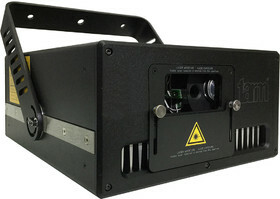 This show laser light has a switchable scan safety and switches for x-axis and y-axis flip. Color intensity can be adjusted with trim pots per color channel. The tarm 2.5 features an integrated ShowNET network interface with free laser control software included! Start with your own professional laser show thanks to the intuitive Showeditor laser show software which comes with every new tarm 2.5 (ShowNET) for free. The Showcontroller software is supported as well and can be purchased additionally. The Pangolin FB4 'Max' runs the Pangolin Quickshow laser control software and offers the possibility to control the show laser system through TCP/IP network, DMX512 control or by the onboard SD-memory. It is equipped with a red (1'400 mW / 638 nm), a green (1'500 mW / 520 nm), and a blue (3'000 mW / 450 nm) diode laser source. The tarm 5 devices have very fast scanners, running at 45kpps@8° ILDA and scanning a maximum scan angle of 45° (@30 kpps), upgrades to CT-scanners with 60kpps@8° ILDA and a deflection angle of up to 60° (@35kpps) are available on request. These specifications definitely make the units perfectly suitable for professional applications and ideal for graphics projections. The tarm 5 show laser projector is a pure diode solution with analog color modulation and a guaranteed output power of 5'000 mW. 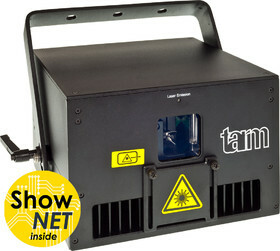 The tarm 5 FB4 show laser has an integrated Pangolin FB4 interface. The Pangolin FB4 is a network interface, which runs with Pangolin Quickshow or Pangolin BEYOND software (available as separate upgrade license). Pangolin Quickshow is already included. There is no need anymore to using ILDA cables to connect the show laser to the control computer. 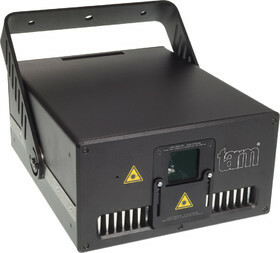 The tarm DOT multi effect laser projector is a whitelight pure diode solution with analog color modulation and unique glass effects. This effect laser light comes with a guaranteed output power of 2'700 mW. It is equipped with a red (700 mW / 638 nm), a green (750 mW / 520 nm), and a blue (1'500 mW / 450 nm) diode laser source. The tarm 11 show laser projector is a pure diode solution with analog color modulation and a guaranteed output power of 11'000 mW. The projector has good specifications with a beam diameter of ca. 4 mm and a beam divergence of less than 1.0 mrad (full angle). It is equipped with a red (2'800 mW / 638 nm), a green (2'900 mW / 520 nm), and a blue (6'000 mW / 450 nm) diode laser source. The tarm 11 devices have very fast scanners, running at 45 kpps@8° ILDA and scanning a maximum scan angle of 50° (@30 kpps), upgrades to CT-scanners with 60 kpps@8° ILDA and a deflection angle of up to 60° (@35 kpps) are available on request. These specifications definitely make the units perfectly suitable for professional applications and ideal for graphics projections. The tarm 11 is controlled via ILDA and is equipped with a newly developed electronics with calibration capability via a browser interface. In addition, color and scanner settings and other parameters can be configured directly via the browser application by connecting the laser directly via LAN (W-LAN is also possible with a suitable access point). Thanks to the browser interface, it is no longer necessary to operate the laser projector directly on the device (since this is often mounted at a height of several meters). All configurations can be conveniently done via a computer (PC, MAC, Linux), a tablet or a mobile phone. 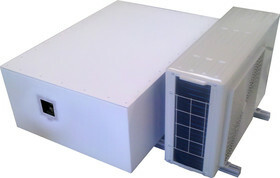 The housing of the tarm 11 is built very rugged and in a dust-proof way, so there is no air circulation inside the enclosure. This reduces maintenance efforts to a minimum. The tarm 11 is suitable for demanding show laser applications and graphics projections in clubs, bars and on medium-sized stages and can be used by beginners as well as professionals. optional CT-6210H with LAS Turboscan: 60 kpps ILDA 8°; max. 60°. The tarm 11 (ShowNET) comes with integrated ShowNET network interface and free laser show software. Details in the box below. The tarm 11 features an integrated ShowNET network interface with free laser control software included! Start with your own professional laser show thanks to the intuitive Showeditor laser show software which comes with every new tarm 11 (ShowNET) for free. The Showcontroller software is supported as well and can be purchased additionally. The tarm 11 show laser projector is a pure diode solutionwith full analog color modulation and already integrated Pangolin FB4 Quickshow 'Max' network interface. Guaranteed output power of 11'000 mW. 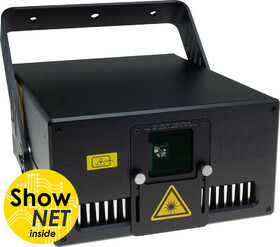 The tarm 11 FB4 show laser has an integrated Pangolin FB4 interface. The Pangolin FB4 is a network interface, which runs with Pangolin Quickshow or Pangolin BEYOND software (available as separate upgrade license). Pangolin Quickshow is already included. There is no need anymore to using ILDA cables to connect the show laser to the control computer. The tarm G 10 OPSL show laser projector is a green Coherent Taipan OPSL solution with analog color modulation and a guaranteed output power of 9'000 mW. beam accuracy and beam shape are extremely advanced, so these units are suitable for demanding professional applications. The tarm G10 OPSL has very good specifications with a beam diameter of ca. 2.7 mm and a beam divergence of only 1.0 mrad (full angle). It is equipped with a green (10'000 mW / 530 nm) Coherent Taipan OPSL module. Other OPSL setups are also available on request. The tarm G 10 OPSL devices have very fast scanners, running at 45 kpps@8° ILDA and scanning a maximum scan angle of 50°, upgrades to CT-scanners with >60 kpps@8° ILDA, LAS Turboscan driver and a deflection angle of up to 70° (@35 kpps) are available on request. These specifications definitely make the units perfectly suitable for professional applications and ideal for graphics projections. The tarm G 10 OPSL is controlled via ILDA and is equipped with a newly developed electronics with calibration capability via a browser interface. In addition, color and scanner settings and other parameters can be configured directly via the browser application by connecting the laser directly via LAN (W-LAN is also possible with a suitable access point). Thanks to the browser interface, it is no longer necessary to operate the laser projector directly on the device (since this is often mounted at a height of several meters). All configurations can be conveniently done via a computer (PC, MAC, Linux), a tablet or a mobile phone. The housing of the tarm G 10 OPSL is built very rugged and in a dust-proof way, so there is no air circulation inside the enclosure. This reduces maintenance efforts to a minimum. 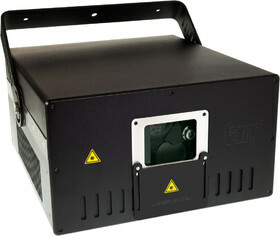 The laser projector is equipped with a Coherent Taipan OPSL HD (High Definition) laser module: 5'000mW / 530nm OPSL HD. Other OPSL setups are also available on request. The tarm G5 HD standard comes with very fast scanners at a scan speed of 45kpps@8° ILDA for professional graphics projections. Optionally this laser system is also available with even faster CT-6210H scanners incl. LAS Turboscan drivers. This tarm show laser system is equipped with a Coherent OPSL HD laser module with TEM00 beam profile (TEM = Transverse electromagnetic mode) . At TEM00 the brightness of the beam spot is homogenously distributed in a Gaussian curve, so the spot is perfectly round and has no deviances due to wave interferences. Besides that, the tarm HD has an extremely low beam divergence of only <0.5 mrad and a low beam diameter of only 2.7 mm. This results in an extremely increase of brightness in comparison to 'conventional' OPSL laser modules and especially in comparison to diode laser sources. The excellent beam specifications make this laser system ideal for graphics and long distance projections, but also for beam effects, which shall be visible from far away. The tarm HD G5 is controlled via ILDA and is equipped with a newly developed electronics with calibration capability via a browser interface. In addition, color and scanner settings and other parameters can be configured directly via the browser application by connecting the laser directly via LAN (W-LAN is also possible with a suitable access point). Thanks to the browser interface, it is no longer necessary to operate the laser projector directly on the device (since this is often mounted at a height of several meters). All configurations can be conveniently done via a computer (PC, MAC, Linux), a tablet or a mobile phone. 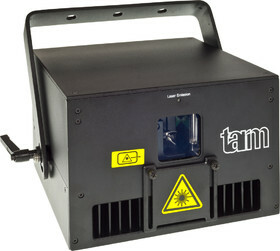 The tarm G5 HD is suitable for indoor and outdoor show laser applications at concerts, festivals and other major events. Demanding graphics projections are possible without any problems. The laser projector is equipped with Coherent Taipan OPSL HD (High Definition) laser modules: 2'500 W / 639 nm OPSL HD, 5'000 W / 530 nm OPSL HD, 2'000 W / 460 nm OPSL HD. Other OPSL setups are also available on request.